If you'd prefer to reserve and collect in-store, without waiting in for delivery at home, search for Echo Dot (black) item #634/9693 or Echo Dot (white) item #622/8439 at Argos online. How does Alexa play radio stations through the Echo/Echo Dot? 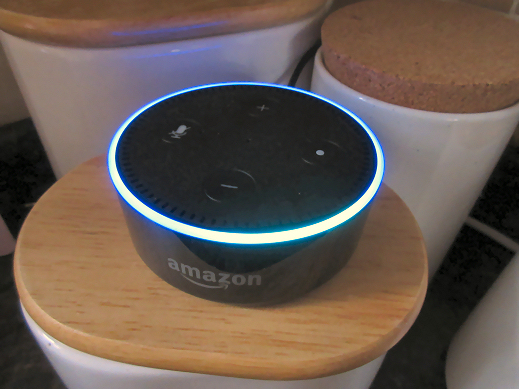 You already know the Echo and Echo Dot are both great home assistants for telling you about the weather, giving you a spoken word newswrap, and letting you create to-do lists and reminders. 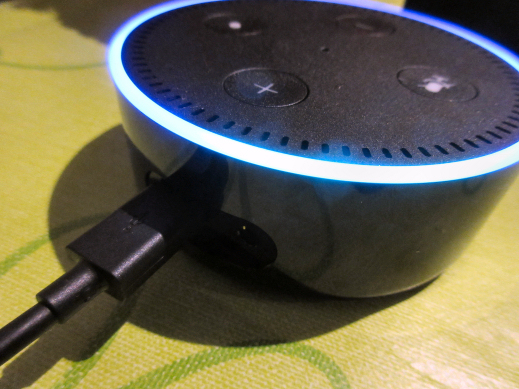 Alexa, the Echo and Echo Dot's built-in talking digital assistant, can help you listen to any number of radio stations, both in the UK and abroad, thanks to the device's built-in TuneIn app and UK RadioPlayer 'skill', that can be enabled on your Echo or Echo Dot using a smartphone or web browser to set up the skill. The Echo and Echo Dot use the TuneIn app which is already set up when you first plug in the device, so you're ready to start listening almost immediately. The TuneIn and, when enabled, RadioPlayer apps react to your voice commands, and will start playing radio stations when you call out Echo's wake word 'Alexa' and the station's name; for example: 'Alexa, Play BBC Radio Four Extra' or 'Ask Radioplayer to play BBC Radio Four'. If you're having issues with Alexa understanding which radio stations you want, check out some ideas for getting Alexa to play the station first time. But, where's the telescopic aerial to pick up radio stations? The answer is, there isn't a telescopic aerial. The Echo and Echo dot stream radio via your wireless internet connection, so the only aerial is a stubby little one hidden in the case, which accesses your wireless router. This means you'll need a good, fast internet connection, 240v power socket nearby (unless you have a battery pack for your Echo Dot), and you'll need to place your Echo/Echo Dot within range of your router, to ensure a decent, wireless signal. So, are the same stations you get on FM, MW and DAB digital radio the same as those you can ask Alexa to find, through your Echo/Echo Dot? Yes, they are. You can find all of your regular stations you listen to via your Roberts, Pure, Sony or Panasonic analogue and digital radio, plus heaps more besides - from the UK and all around the world - provided you know which station to ask for. You may find a few issues or experience problems when asking Alexa to play a radio station. For example, Alexa does get confused with BBC Radio One and BBC Radio Wales. If that happens, try saying the station's frequency instead, e.g. BBC ninety-four point eight, which is one of the frequencies for BBC Radio Wales. BBC Radio Humberside is BBC ninety-five point nine, BBC Radio Merseyside is BBC ninety-five point eight, BBC Radio Cymru is BBC ninety-three point one - you get the idea. Have a look at our station directory for frequencies, if you're struggling to get Alexa to understand the station you want, and give it a try. Just saying the frequency for a radio station will also work for UK-based commercial radio stations - if you're having problems. As local stations tend to broadcast on the same FM frequency number (for example, Free Radio in Birmingham and The Wave in Swansea both use 96.4fm), depending on where you are in the country, TuneIn may pick the station closest to you. Again, check out our station directory and give it a try: ask for a station by frequency - say Alexa [or Amazon/Echo/Computer if you've changed the wake-up word], play ninety-six point four fm. You can also try a voice remote, if you're further away from the device's built-in microphones and are struggling to be understood from across the room. You can also ask Alexa to play any mp3s you've purchased through Amazon via the Echo/Echo Dot. Alexa will stream your music from your Amazon Music locker, held in the cloud, to your device. The Amazon Echo Dot is available now in white or black for £49.99. The Dot has a built-in single speaker and is mains powered. You can also buy the Amazon full-size Echo with bigger speaker for £149.99. If you'd prefer to click and collect on the highstreet, search for Echo Dot (black) item #634/9693 or Echo Dot (white) item #622/8439 at Argos online.